The Arizona Daily Star is reporting that the Faith Christian Church, accused of being a cult by former members, is now without a building for services. The Star also disclosed that the University of Arizona found no violations of the student conduct code in the operation of FCC’s student groups on campus. The action by UA doesn’t relate to the church nor does it prevent the school’s University Religious Council from keeping the church’s student groups from membership. In March, Tucson, AZ church Faith Christian Church was rocked by allegations that church leaders encourage spanking of infants and practice coercive cult-like control over member’s personal lives and finances. FCC runs three student groups on the UA campus where many of FCC members begin their relationship with the church. FCC boasted membership in the Evangelical Council for Financial Accountability but later dropped membership amid an ECFA investigation. ECFA never released results of that inquiry. Former members were disillusioned by the lack of transparency. Now the church will no longer meet in Amphitheater High School following a school district investigation into the church. The standards are different for a public university than for our organization. Because we are a member organization we hold our members to a higher standard, and it is one which all organizations agree upon when they are accepted for membership. Organizations need to go through an application and voting process in order to join the URC. FCC’s groups were voted out by the religious council last year. This year the organization’s membership directory connects the ban to characteristics of a cult. After Faith Christian Church dropped membership in the Evangelical Council for Financial Accountability, the point person for former FCC members involved in providing testimony to the EFCA, Rachel Mullis, expressed her disappointment with ECFA’s decision not to publicly release the results of the investigation. FCC took the cowards way out and so did ECFA. They obviously feel no moral obligation to protect the Christian community, and they have no interest in telling the truth. Their only public comment was to defend the FCC organization. You would think that after making such public remarks in their defense they would want to complete their investigation and release their findings. Cowards, they owe us all a public apology! Wade makes a great point. The ECFA publicly defended the church before doing any kind of investigation. Given that the ECFA went out on a limb in the press to defend FCC, it seems reasonable to think they comment publicly now that they know more. I believe that if an organization wants to maintain their credibility then, they must adhere to their policies and speak out when those policies/standards have not been met. They say that their mission is to protect the Christian community. To allow a church to resign in the middle of an investigation and not say anything about what was being investigated seems to make us question how respectable they are. They didn’t have to give all the details, but they could have at least said something about them leaving other than that they have decided to resign. They have a responsibility to the hundreds of people who left FCC and are still a part of the Christian community. I, for one, am not very impressed with the integrity of the ECFA. To me it shows laziness. ECFA doesn’t want to finish compiling and publishing a report for an organization not under its oversight anymore. But to let an organization just leave in order to halt any investigation is a major loophole that shouldn’t be there. The FBI doesn’t halt an investigation when someone leaves the country and just say “oh well nothing we can do, they left”. ECFA needs to complete what they started ad make the results public so that people will take them seriously. Since this loophole exists the ECFA really isn’t protecting members and donors at all. This post is a follow up to the resignation of Faith Christian Church from the Evangelical Council for Financial Accountability. I reported early in April that FCC resigned from the ECFA. FCC was being investigated by the ECFA for possible violations of ECFA guidelines. Numerous former members had described the extreme pressure to give 10% or more of their income to the church along with other problems at the church. Thanks for your follow-up. Since they have resigned there is not anything further we are able to say other than to cite their resignation. Regarding follow-up with the former members, I have sent an update this afternoon to each person who responded to thank them similarly for their assistance and to give them the same update. This is another example of how the ECFA’s decisions do not serve donors or the public. All that a prospective donor would know about FCC from the ECFA is that FCC resigned. The ECFA should have a category of resignation that indicates that an organization resigned while under investigation. Faith Christian Church has voluntarily resigned membership from the Evangelical Council for Financial Accountability. The ECFA was in the middle of an investigation of the church’s compliance with ECFA’s guidelines. By resigning, the church can escape that process. I have asked the ECFA if they plan to issue a report and will report any response I receive. If the past is a guide, I am not optimistic that the ECFA will publicly comment. The Washington Post’s Susan Svrluga posted a statement from the Evangelical Council for Financial Accountability about their ongoing examination of Faith Christian Church. ECFA evaluates and accredits ministry organizations, including churches, only with regard to their compliance with our Seven Standards of Responsible Stewardship. Occasionally we are presented with complaints or accusations about a member organization and while we do not automatically dismiss such concerns, the scope of our investigative authority and purview is, according to our bylaws, necessarily limited to issues directly related to these seven standards. With regard to Faith Christian Church, we are working to ascertain if, in fact, any complaint expressed from former church members falls within the scope of our seven standards. As I reported recently, ECFA executive vice president John C. Van Drunen has interviewed at least one former member of Faith Christian Church and expressed an intention to interview those who signed a letter of concern to the ECFA. Given what I have heard from former members, it seems inconceivable that the ECFA would find Faith Christian Church in compliance. Summary. A member’s commitment to the evangelical Christian faith is the cornerstone of ECFA membership. The word “evangelical” connotes more than mere subscription to a doctrinal statement. It includes commitment to an ethical and moral lifestyle that seeks to conform to a biblical norm. It is the lifestyle envisioned in ECFA’s own statement of faith: “We believe in the present ministry of the Holy Spirit, by whose indwelling the Christian is enabled to live agodly life” (emphasis added). Faith Christian Church has been accused of encouraging the abuse of infants. Multiple remorseful parents and witnesses have come forward with public statements to this effect. If the ECFA is not investigating this aspect of the situation, then they are not adhering to the spirit of this guideline. There is no universe where the child rearing practices described by former members should be tolerated in an ECFA member church. In the eyes of many Mars Hill Church former members, the ECFA’s reputation was tarnished by their lack of transparency surrounding financial and leadership issues at the former mega-church. How the ECFA handles this situation will be a major test of their credibility. 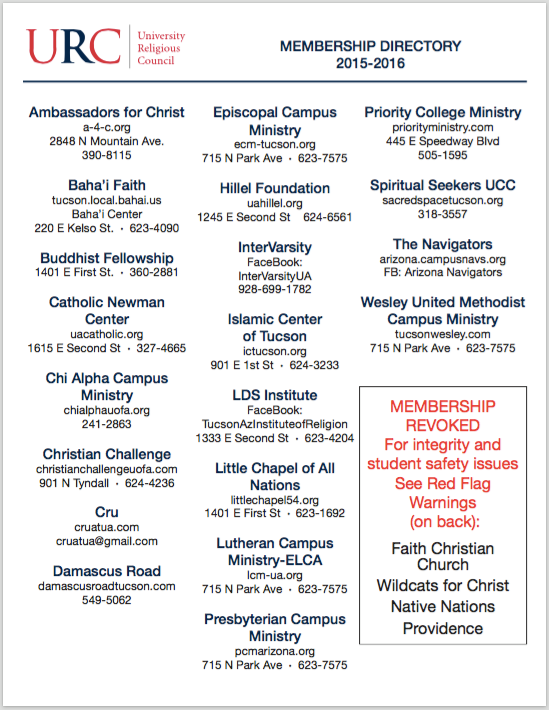 After investigative reports from the Arizona Daily Star in early March disclosed numerous complaints from former members of the Faith Christian Church (Tucson, AZ) about child rearing practices, mind control, and financial control over members, the University Religious Council of the University of Arizona revoked the membership of Faith Christian Church’s campus ministries. I just received the following statement from URC’s representative Michelle Blumenberg. Effective immediately, the University Religious Council (URC) at the University of Arizona revokes from membership the organization known as Faith Christian Church and its affiliates Wildcats for Christ, Native Nations in Christ, and Providence Club. 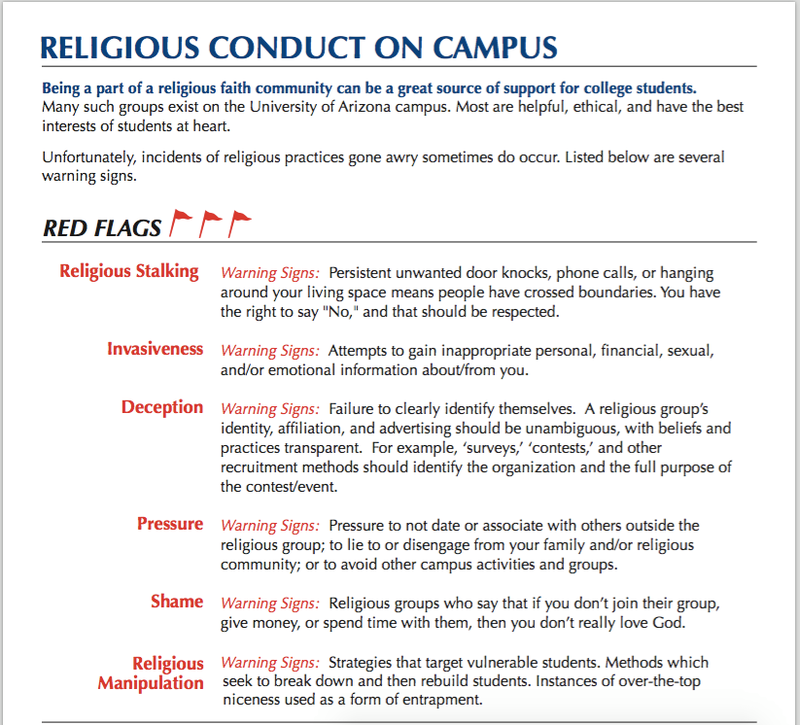 Reason: The number, seriousness, and pattern of red flags raised compel URC members to no longer believe that Faith Christian Church and its affiliates operate at the highest level of integrity, transparency, safety for students, and respect for students, standards required for URC membership. This has come to light via numerous letters and testimonies recently sent to URC members which have brought to a head historic and current concerns related to the campus activities of Faith Christian Church and its affiliates. This action follows similar actions by two colleges in New Zealand regarding an affiliate of Faith Christian Church there. Last week, I reported that an executive from the Evangelical Council for Financial Accountability planned to interview a former member of Faith Christian Church. According to Rachel Mullis this phone meeting took place. Mullis considered the meeting fruitful and she told me that Executive Vice President of ECFA, John C. Van Drunen planned to contact all former members who signed the former member’s letter to the ECFA. According to Mullis, contacts have been made by email with an unknown number of former members providing information to the ECFA. Another Palmerston North education institute has issued trespass notices against religious leaders of a “cult-like” church from its campuses. UCOL, a polytechnic with campuses in Palmerston North, Whanganui and Masterton, has confirmed it has trespass orders filed against a group of Manawatu-based church leaders connected with the Palmerston North Victory Christian Church. The move follows the stance of Massey University, which on Monday issued trespass notices to nine church leaders from it campuses in Palmerston North, Wellington and Auckland. Nearly a dozen people with connections to Victory Church have come forward following a series of stories highlighting concerns about the parish’s practices, including manipulating marriage pairings, public shaming of members and excessive control over the congregation’s strong student membership. Most recently, North Victory’s pastor Joel Miller contested the claims of former members and offered to meet with them. To my knowledge, none of the U.S. pastors have spoken publicly. Last week, former members of Faith Christian Church asked the Evangelical Council for Financial Accountability to include them in the ECFA’s investigation of the church. Faith Christian Church was accused of coercive leadership and financial tactics by former members in an article in the Arizona Daily Star in a series of articles beginning on March 12. Since then, the ECFA initially defended the church but then told the Arizona paper that an ECFA executive was in Tucson to investigate. As of last week, the former members of the Faith Christian Church had not been included in that investigation. However, after the letter was sent to the ECFA, Executive Vice President of ECFA, John C. Van Drunen requested a meeting with one of the former members, Rachel Mullis. The meeting is scheduled to take place Wednesday, March 25. The letter from 22 former members is below. We write as former members hoping to engage you in a discussion of our experience at Faith Christian Church in Tucson, AZ. We are aware that Faith Christian Church has been a member of the ECFA since 2004. Many of us have attended since then and are aware of the practices of the church while it was a member in good standing with the ECFA. We saw in the March 12 issue of the Arizona Daily Star that the ECFA is conducting an investigation of Faith Christian Church and has sent an executive to Tucson for that purpose. We welcome this news, however we respectfully ask that the ECFA investigators speak to former members about violations of ECFA guidelines. We can offer unique insight to the financial policies that current members or current church leadership cannot. In violation of ECFA’s Donor’s Bill of Rights, most of us experienced pressure to donate at least 10% of our income while at the church. 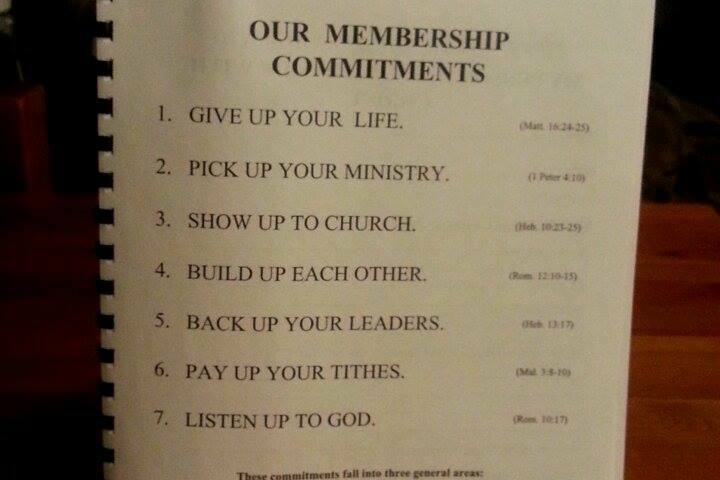 In fact, it is clearly written in their membership that tithing is a requirement for membership. If someone did not comply with this requirement, they were often notified that they were not trusting in the Lord and that they would be cursed. The pastor, Steve Hall, often said he would not pastor cursed people. Weekly, most of us gave our 10%, but the church also encouraged a financial offering on top of that. We could not designate where our tithe went, but we could designate where we wanted the offering to go (missions, building fund, etc.). Sometimes, staff members from the church would ask to see the tax returns or bank statements of church members so that the leaders could know the exact figure the members were to give. Some members were even pushed out of the church for not giving the required amount. Church members were allowed to see the church budget if they asked, although most of us would have felt uncomfortable doing so. The financial statements were never reported in a church bulletin or discussed at a church meeting. There was no outside agency that helped determine church spending, salaries, audits, or financial policies, although Steve Hall did use a formula to justify his salary of $100,000+ a year. Non-staff members did not know how the tithe was being spent. We ask that you contact ___________ at ­­­­­­­­­­­­_____________ or _____________ to facilitate interviews with former members for the purpose of investigating the issue of compliance by FCC with ECFA standards. The Undersigned Former Members (22 names redacted at their request). Previously, I posted stories of abuse and pastoral control being alleged by former members of Faith Christian Church in Tucson, AZ. In the Arizona Daily Star article that broke the story, Faith Christian Church was defended by Dan Busby, president of the Evangelical Council for Financial Accountability as a member in good standing. Since then, the ECFA told the Daily Star that an executive is investigating. Last week, I asked Dan Busby if the ECFA had plans to talk with the former members. He did not reply. However, according to Rachel Mullis, none of the former members disclosed any contact from the ECFA to date. Below see the requirements for members. While other churches require financial support as a part of a covenant, according to the former members, FCC tied curses, and loss of membership to invasive enforcement. Restrict or designate your gifts to a particular project within the organization’s mission objectives. The former members of FCC and sister churches describe coercive tactics by church pastors and elders to gain contributions. Aaron Marley was a bookkeeper at sister church Hope Christian Church in Tempe, AZ. He told me that the giving history of members is reviewed by the ministers. Marley said a minister, who was not part of the church administration, interrogated him about his giving because it didn’t meet expectations. Marley assumed a church would keep giving records for tax purposes but not for the purpose of coercing donations. There was one occasion when some of the staff, including me, were caught not tithing soon enough. We were waiting until we had deposited our checks into the bank to tithe to the church. Steve found a verse in the OT about paying late fees for late tithes, so we were forced to pay extra for our lateness. So, essentially the ministers raised their own salaries and gave 13% of that and beyond to the church, which went to pay Steve’s salary along with the other members’ tithes. A thorough investigation by the ECFA should take into account testimony from former members.